Drake and Future's Summer Sixteen Tour rolled into Detroit on Tuesday night, and the Toronto rapper had a surprise guest for concert attendees. During his set, Drake brought out Eminem to perform "Forever" and other hits. After the performance, Drake turned to the crowd at Joe Louis Arena, saying, "Make some noise for the greatest rapper to ever touch a microphone." Earlier this month, Ebro Darden reported that Drake was ready to enter into a verbal battle with the Detroit MC, before recanting on Twitter and chalking the incident up to a joke. Watch clips of Drake and Eminem performing together on the Summer Sixteen Tour in Detroit below. 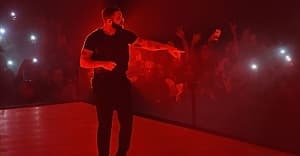 What Beef: Drake brings out Eminem at Detroit show to diss Hot 97 and prove he's King of petty.